When I left Cleveland, I was on a mission. I was seeking championships, and we won two. But Miami already knew that feeling. Our city hasn't had that feeling in a long, long, long time. My goal is still to win as many titles as possible, no question. But what's most important for me is bringing one trophy back to Northeast Ohio. 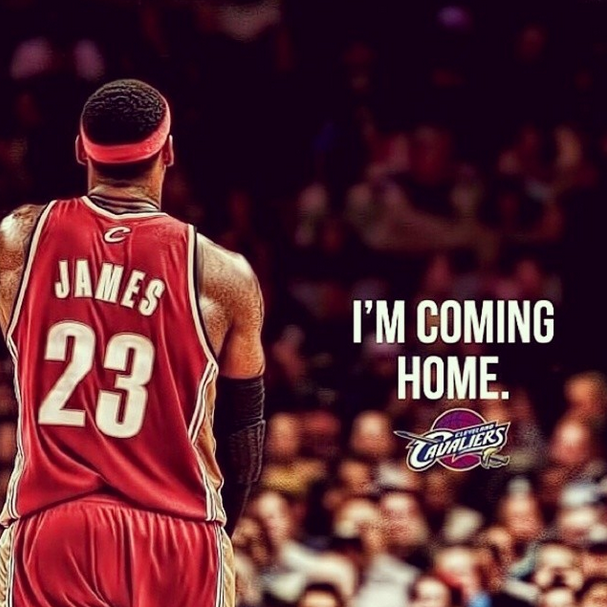 I always believed that I'd return to Cleveland and finish my career there. I just didn't know when. After the season, free agency wasn't even a thought...I looked at other teams, but I wasn't going to leave Miami for anywhere except Cleveland. The more time passed, the more it felt right. This is what makes me happy. The whole piece is an interesting read to say the least, and I think James has realized that "The Decision" was a mistake and this was a much better way to go about his free agency. But also, it is very easy to be cynical about this decision: Cleveland offered James a better chance to win now and down the line with their supporting cast than did Miami. James left Cleveland to win championships in Miami. He succeeded but we saw against the Spurs in the Finals, he really was not that far off from where he was in Cleveland in 2010. His supporting cast really fell apart and with a young, promising supporting crop in Cleveland, why not go home, be the hero, and aim to win a title for the hometown club? He is saying everything he should say, especially how he says that he is not promising a championship and saying that he wants to help Kyrie Irving take the next step, help "elevate" Tristan Thompson and Dion Waiters and reunite with his buddy Anderson Varejao (People are wondering whether him not mentioning top pick Andrew Wiggins could mean a potential Kevin Love trade, something I am skeptical whether they should make such a move). And in an Eastern Conference that is certainly not the Western Conference, they may just be the conference favorite. Washington has a talented and young corps that is largely returning (pending Trevor Ariza), but they are also a little inexperience and coached by Randy Wittman. Indiana will still be tough to take out, but who knows how dangerous they will be if Lance Stephenson leaves and who Roy Hibbert is. Chicago is a strong club and dangerous with Derrick Rose, but will Rose be able to hold up? This Cleveland roster starts to look mighty tasty when compared to the rest of conference, especially as James makes his surrounding cast better and will allow Irving, who is a great player but probably not one that can carry a franchise, to truly prosper. However, James is right, Cleveland is (probably) not winning the title next year, particularly with a new head coach in David Blatt. Blatt is highly regarded and widely thought to be an intelligent coach, but he has also never worked in the NBA before, having gained his coaching experience overseas. Even as somebody who admittedly wanted James to go back to Miami (sue me), this is a cool story seeing a player like James, an all-time great at the peak of his powers, going back home to lead Cleveland to the title they have never gotten. But even as it seemed that there was some fire with the Cleveland smoke, it still felt surprising that he ultimately decided to go home again. And how about some plaudits for Pat Riley and Heat owner Micky Arison. Instead of doing something shrill like Dan Gilbert with his letter, which happened to be removed from the Cavalier website a few days ago and Gilbert happens to be conveniently apologetic for despite not being so months ago, Riley and Arison have shown nothing but class with Riley finding no fault with James wanting to go home and Arison thanking James for the memories. Even after arguing that James was ultimately going to go back to Miami, maybe he made the right move after all.